The extremes of a multilateral meeting — in which Pakistan and China are excluded— to one in which the Indian Navy is expected to join them for a uniquely joint exercise. 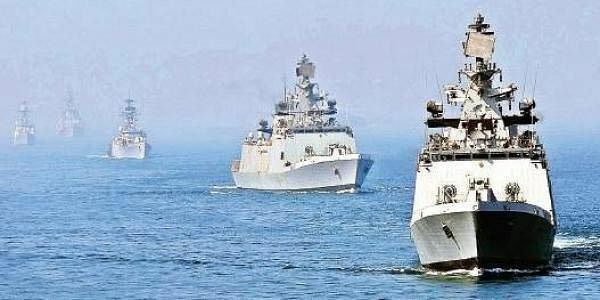 NEW DELHI: A maritime competition is set to shake waters around India from November with the navies of India and China joining the forces of a set of Asian countries in two meetings, one on each of India’s western and eastern seaboards. In the first meeting being hosted by India in Goa from Wednesday, Pakistan and China are excluded. In the second, to be hosted by Bangladesh at the end of the month, the navies of India, China and Pakistan are not only expected to meet in conference rooms but are also scheduled to exercise jointly. This might sound surprising given the conventional understanding that India and China are in a race in the Indian Ocean region not only to make more allies but also to secure their sea lines of communication. Both countries are heavily dependent on oil supplies from West Asia and Africa. The extremes of a multilateral meeting — in which Pakistan and China are excluded by India — to one in which the Indian Navy is expected to join them for a uniquely joint exercise, somewhat define a new Indian Ocean ‘great game’. The waters of the Arabian Sea and Bay of Bengal reflect the twists and turns of geopolitics on the ground. In New Delhi on Tuesday, India rolled out the red carpet for the king, queen and prince of Bhutan. This the first such high-profile visit since the Indian and Chinese armies pulled back from the brink on August 28 in Bhutan after the 73-day stand-off in Dokalam. The stand-off was in territory that China and Bhutan dispute. The Indian soldiers moved into Dokalam on Bhutan’s request. But Thimphu went silent immediately afterwards. Now Bhutan’s King Jigme Khesar Namgyel Wangchuk is in New Delhi with his family on a state visit. Though the king has formally handed over powers of governance to prime minister Tshering Tobgay, the royal family’s historic and traditional ties with India and his own influence weigh in on strategic decisions such as border disputes. China is eager to institutionalise diplomatic relations with Bhutan. Thimphu is still making up its mind. Defence minister Nirmala Sitharaman, who is scheduled meet to the king in the capital on Thursday, is now in Goa to inaugurate the first of the two maritime meetings that is sending mixed signals in the geopolitics of the Indian Ocean region. Sitharaman is scheduled to inaugurate the “Goa Maritime Conclave” at the Naval War College in INS Mandovi. The “Goa Maritime Conclave” is potentially a powerful new construct of Indian Ocean littoral countries headed by India. It excludes Pakistan and China. The first conclave is expected to be attended by the chiefs of no less than ten navies/maritime agencies from Bangladesh, Indonesia, Maldives, Malaysia, Mauritius, Myanmar, the Seychelles, Singapore, Sri Lanka and Thailand.